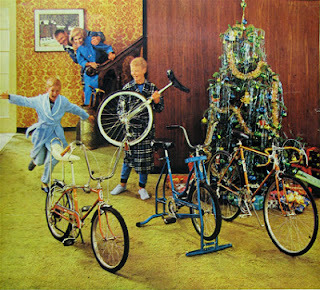 From the Century Cycles family to your family, we wish you a happy, healthy, and safe 2013! If you don't mind dodging a few piles of snow, and have plenty of cold weather cycling gear, there are a number of New Year's Day ride options to start the new year off right! 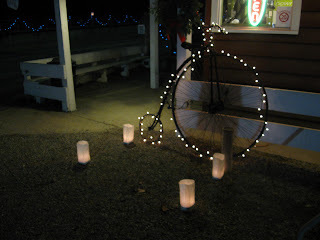 Medina - A Bi-Cycling Dandy Excuse For Getting Hibernated in January (ABCDEFGHIJ) Ride! 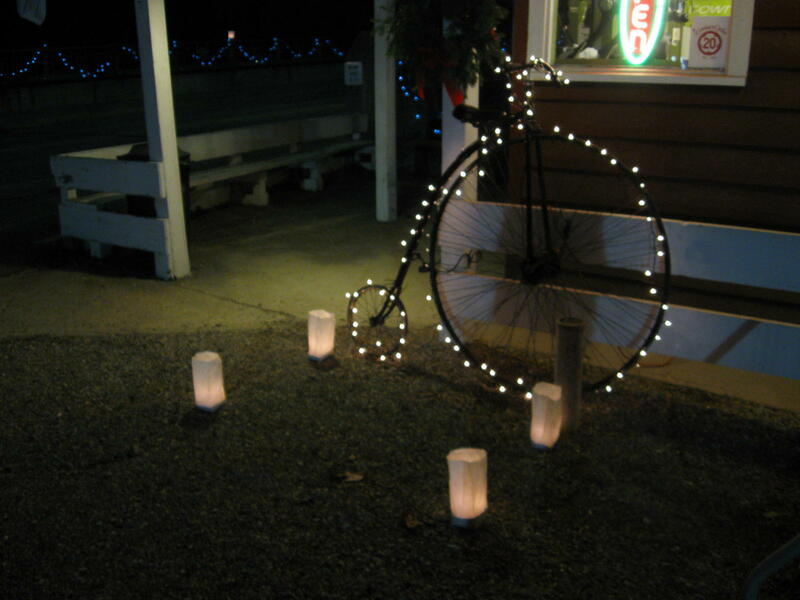 - The Medina County Bicycle Club's New Year's Day tradition begins at 12:00noon on the Public Square in downtown Medina. Cleveland - New Year's Day Poker Ride organized by the Cleveland Area Mountain Bike Association (CAMBA). Begins at 12:00 noon at Lincoln Park in Tremont. 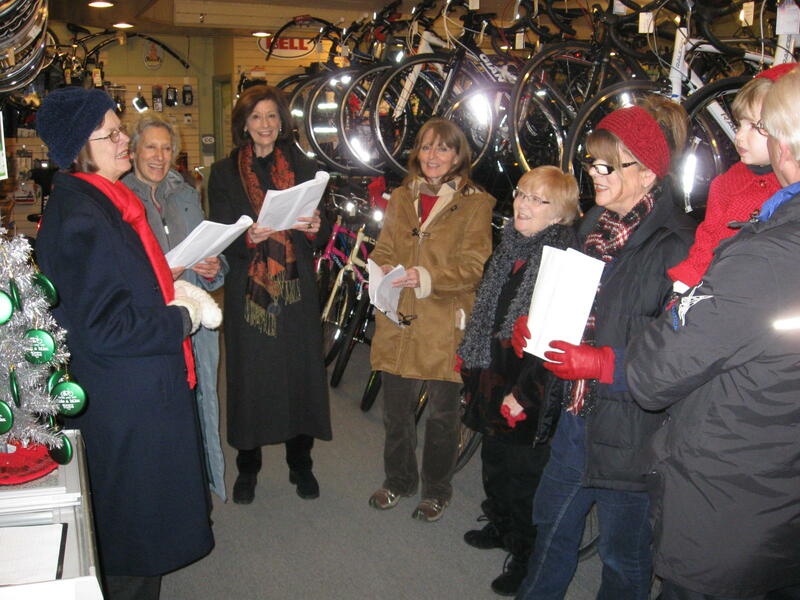 Mentor - Cleveland Touring Club's annual Freeze d'Ride, begins at 10:00am at Chase Bank, 6081 Andrews Rd, Mentor-On-The-Lake. 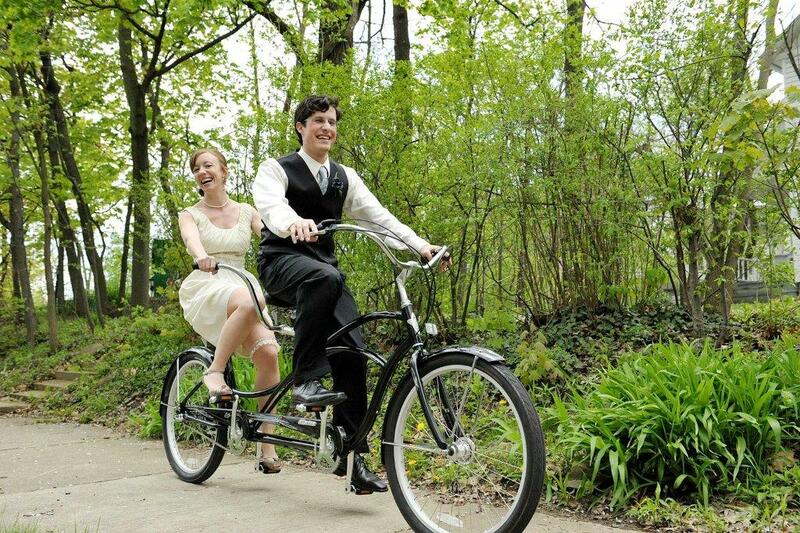 Or plan your own ride, and share pictures and stories with us on our Facebook Page! With the new year comes new store hours in Peninsula. All three stores are CLOSED on January 1, and beginning on January 2, the Peninsula store will close at 6:00pm on Mondays and Wednesdays. 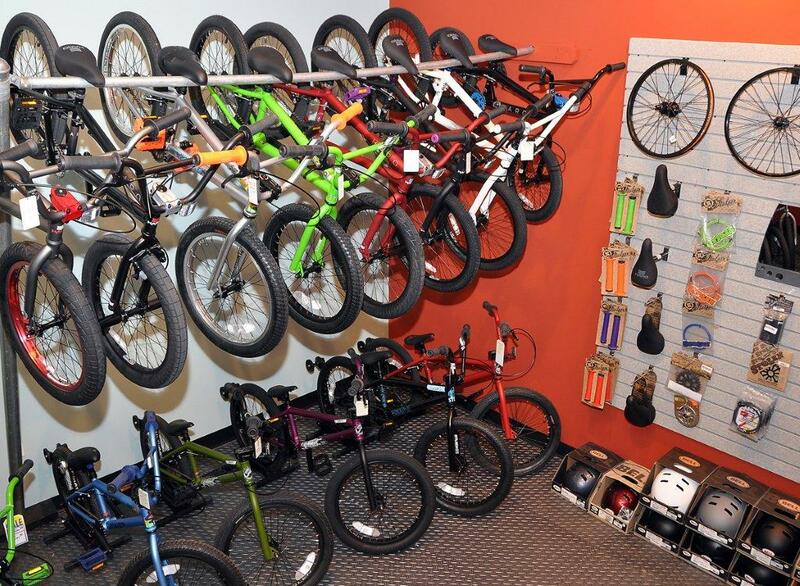 We'll remain open until 8:00pm on Tuesdays and Thursdays (except Feb. 14) due to our FREE Bicycling and Maintenance Clinics! Hours of operation for Medina and Rocky River are unchanged. Our schedule of FREE clinics continues this Thursday, January 3 with GPS and Fitness Apps, beginning at 6:30pm in all three stores. As we enjoy the post-Christmas celebration, this week is also the time that many people starting looking at finalizing their finances for the year, which includes looking at your Health Savings Accounts and employee wellness benefits. Does your employer provide wellness benefits? Don't let 2012 run out without using them. 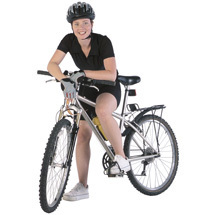 In many programs, a bicycle counts as a wellness expenditure! Half-Off prices valid Dec. 27, 2012 thru Jan. 9, 2012 while supplies last. Included in the 5 Things to Bring on Every Bicycle Ride are a mini-pump and a spare tube, and every pre-ride safety check involves using a floor pump to make sure your tires are running at the recommended pressure. If part of your New Years resolution is to be ride more and be prepared on every ride, then we've got you covered with this latest Hot Deal for Cold Days! The Giant Control Tower 2 Floor Pump in Fire Engine Red is an affordable pump featuring a durable metal barrel, a sturdy base, an ergonomic handle, and built-in pressure gauge for efficient pumping. With a maximum of 160psi and an Auto Head that works with Presta or Schrader valves without the need for adapters, it works great on all road, mountain, and hybrid bikes. The Serfas Half-Stick Mini-Pump has a telescoping barrel and flip-out handle to let you fill tires up to 100psi fast and easy. You can mount it on your bike's frame using the included bracket, but it's small enough to fit in a pack or jersey pocket. The head works with Presta and Schrader valves, and has a built-in dust cover to keep out debris. 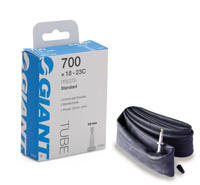 Now's the time to stock up on inner tubes! Take 50% off any in-stock tubes. 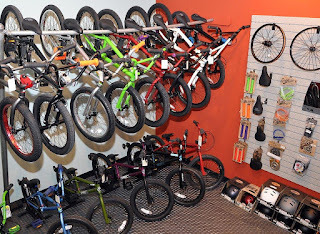 We've got a vast selection in stock for road, mountain, hybrid, and kids' bikes! Even extra-long-valve tubes for aerodynamic road wheels! 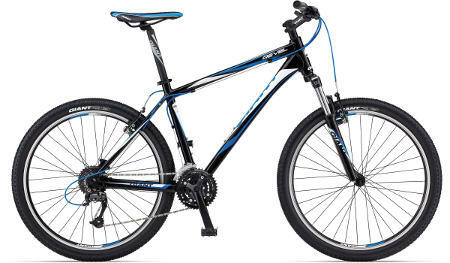 This Hot Deal is good only December 27, 2012 - January 9, 2013, while supplies last. In-store purchase only; no online or phone orders accepted. No coupon necessary. Learn to fix a flat tire! in the living room on Christmas day. Don't clean it up too quickly." Merry Christmas from all your friends at Century Cycles! Our stores will re-open tomorrow at 10am, with our Holiday Sale on everything still running through December 31. Northeast Ohio folks will get the chance to come out of hibernation and enjoy the best that Cleveland's winter season has to offer at Winterrific, an event organized by the Cleveland Metroparks. 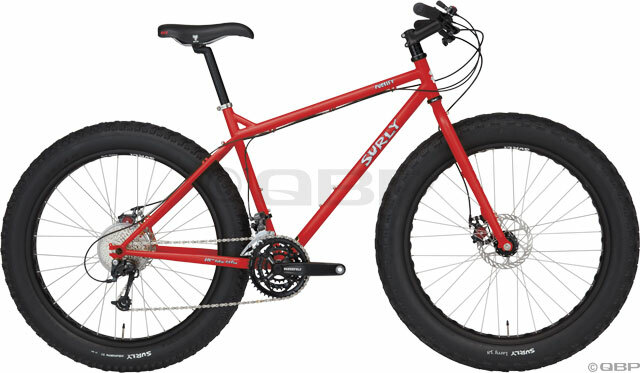 The schedule of events includes nature hikes, dog sled demonstrations, ice carving demonstrations, horse-drawn wagon rides, winter crafts for kids, winter how-to-dress demonstrations and, courtesy of Century Cycles and the Surly Pugsley (pictured below) and the Surly Moonlander, SNOW BIKE demonstrations! The Chalet's famous Toboggan Chutes are also open for business. 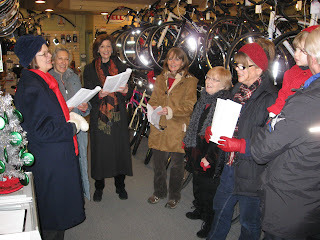 Click here or see the slideshow below for pictures from Winterrific 2012! 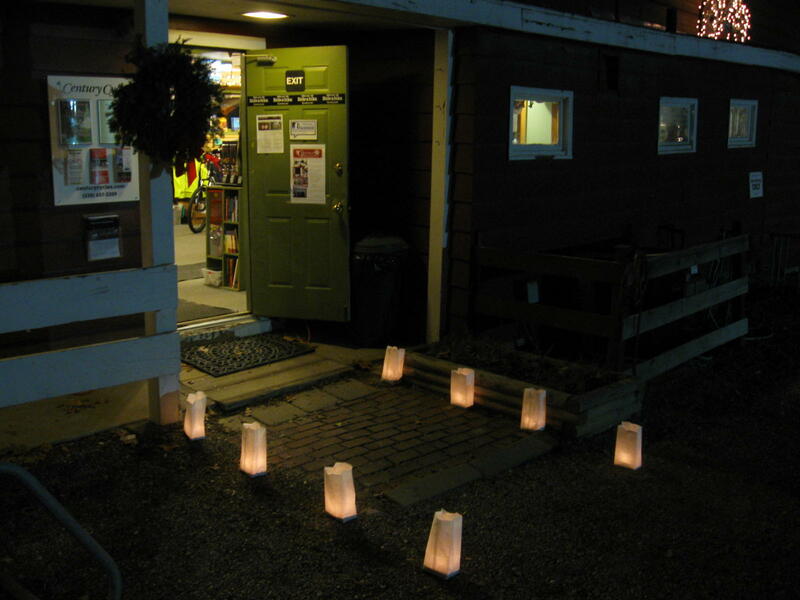 This is also the time of year to do some good for our fellow bicyclists. 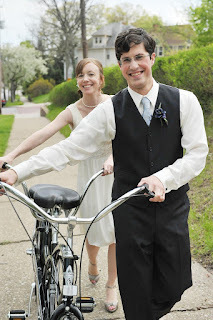 That's why the list includes ways you can become a member of or donate to some terrific bicycling advocacy groups like Bike Cleveland, Adventure Cycling Association, Bikes Belong, People For Bikes, and more. 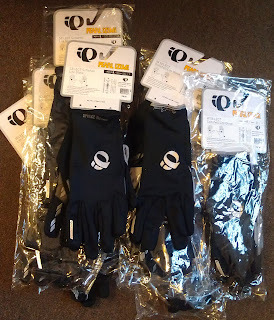 This big ol' pile of Pearl Izumi men's and women's gloves has been divvied up between the three Century Cycles stores and will be given away at the conclusion of the Dressing For Winter Cycling clinic at each store this Tuesday, December 18, at 6:30pm. Attendees will have their names entered into a drawing for one men's pair and one women's pair of SELECT Softshell Lite Gloves worth $35 each. The gloves feature SELECT Softshell Lite fabric on the back of the hand, which sets the benchmark for lightweight wind and water protection, and Thermal Lite fabric in the palm to deliver superior moisture transfer and warmth. A soft, windproof fleece wiping surface on the glove will also come in handy. Big thanks to Pearl Izumi/Cycling and our excellent PI rep, Chip Ellison, for supporting our winter clinics! 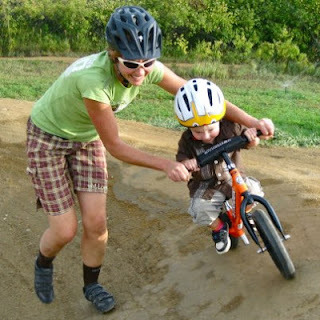 For more information about Century Cycles' winter clinics, go to www.centurycycles.com/goto/clinics. The Blackburn Voyager 3.3 Headlight/Mars 1.0 Taillight Combo is always our most popular Hot Deal ever and is Century Cycles' best-selling light set - a terrific choice for cyclists of all ages and bikes of all kinds. The headlight sports three super-bright LEDs with flash and steady modes, plus it easily attaches to all handlebars without tools. The Mars 1.0 taillight has four ultra-bright red LEDs with mounts that can attach to your bike, pack or rack. The Blackburn Flea 2.0 Headlight/Taillight USB Combo is always on the top holiday gift lists and we agree it's a cyclist's favorite - especially with its lithium-ion battery that can be conveniently charged in the USB port of a computer or laptop. 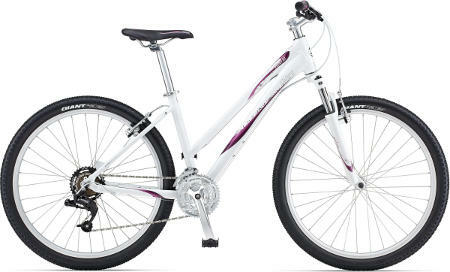 Easy to mount, this combo boasts a surprising amount of brilliant LED light for front and rear visibility on the bike. NiteRider's Mako 1-Watt Headlight has an LED lamp with low and high-beam modes that give you enough light to see on casual bike paths, a flashing mode for on-road visibility, and red "gills" on the side to help you be seen even better. You get up to 300 hours of run time from the two included AA batteries. This Hot Deal is good only December 13 - 26, 2012, while supplies last. In-store purchase only; no online or phone orders accepted. No coupon necessary. 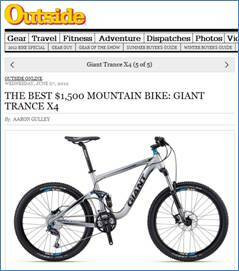 Outside: Giant Trance X4 "Best $1500 Mountain Bike"
Visit Outsideonline.com and you’ll find a review from staff writer Aaron Gulley that takes a look at the best budget mountain bikes, with the Giant Trance X4 taking the honors in the $1,500 range -- and just imagine how much they'd like it knowing we've marked the Trance X4 (size M in stock at Century Cycles - Medina) down to $1,399.99? I try to get in one cyclocross race each season. I'm not competitive, but like to race once in a while just for the fun and challenge of it. Last month, on the Sunday before Thanksgiving, my schedule and the race schedule aligned, and I was able to attend the race located at the Ohio Agricultural Research and Development Center in Wooster, Ohio, organized by a group known as RideOn Cycling Team/Soup Can Racing, and part of the Northeast Ohio Cyclocross Series. The weather cooperated as well, with sunny, warm, and dry skies rather than the usual fall cyclocross wetness and mud. After I registered, a guy registered right after me, and I noticed that he was the same age and in the same category as me. He was dressed in sneakers, cargo shorts, and a white cotton t-shirt--definitely not looking like a "serious" racer, but something told me that this guy would be my "mark" for the day. 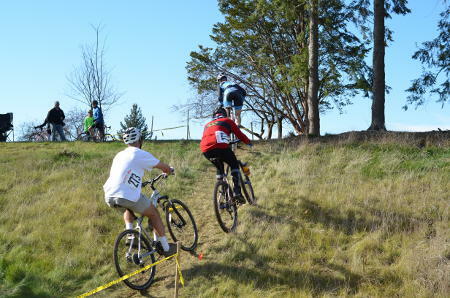 The course description on the event flyer said "This course will be designed trying to adhere to UCI Standards. We have all of the necessary features available." I took this to mean that it would be a very traditional cyclocross course, with many standard barriers and run-ups. 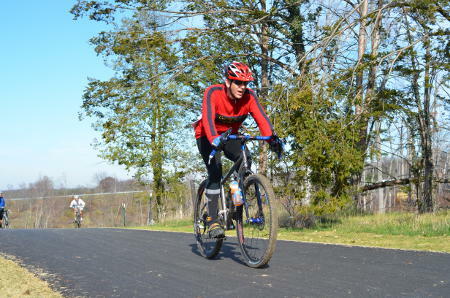 However, I think everyone there would agree that the course could be described as "very mountain-bikey." 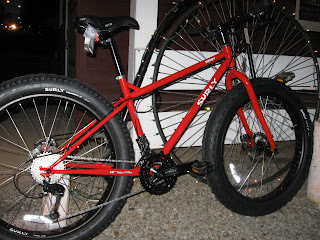 I rode my 29er mountain bike (which is set up with a drop handlebar and rigid fork), and I was greeted more than once with the comment "It looks like you brought the right bike for the day!" The starting line was at the base of a short, paved hill, which served to space the group out from the start. A couple hundred yards to the top of the hill and the course turned a sharp left into what I referred to as the "spectator loop." There was a steep downhill, followed by a steep uphill, then a couple of swoopy curves, all on grass, then a short paved climb up to the finish line. 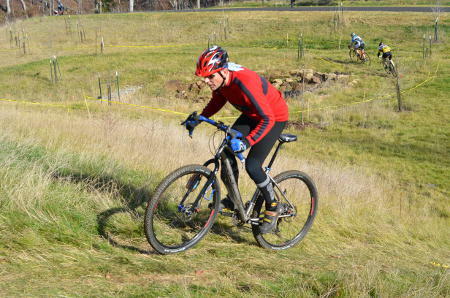 Here I am going down the first descent at the start of the spectator loop. White t-shirt guy was hot on my tail at the start of the spectator loop. He dismounted on the climb, but just after than he passed me going through the curves. Me and white t-shirt guy heading up the first climb on the spectator loop. White t-shirt guy was not a very good climber, so on the paved climb leading to the finish line, I passed him up and got a good gap on him. Heading up the paved climb towards the finish line. The main loop of the course continued past the finish line and was almost continuously uphill for about a half-mile, then cut across and dropped downhill with some hard curves for about a half-mile, before we turned a hard-right back onto the spectator loop. This downhill had the only barriers on the course, which consisted of two large logs, one right after the other. My dismount and remount skills were a little rusty the first time around, but I got the hang of it more on subsequent laps. There were some soft spots in the grass throughout the main loop, but nothing too muddy and unmanageable. 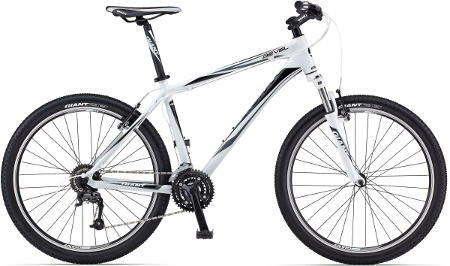 Soon after my first turn over the logs, white t-shirt guy was breathing down my neck and passed me up again; he must have been able to ride the downhill pretty aggressively on his standard 29er mountain bike. I passed him up again on the paved climb before the finish line. We repeated this cycle for the next couple of laps. I lost track of time and the number of laps after a while. As I crossed the finish area for the 3rd, 4th, or maybe 5th time, I was sure we'd have one lap to go. When I saw and heard the race official announce "Two to go," I almost threw up. In cyclocross, that's the sign that you're doing it right. 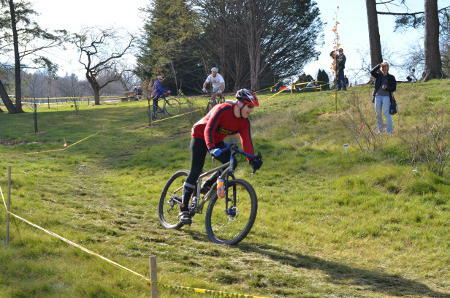 So, even if you're not a "serious" rider or racer, give cyclocross racing a try some time. It's a great workout and fun test of your skills. Bring the significant other and the kids along, because of all the types of bike racing, it's the most spectator-friendly. 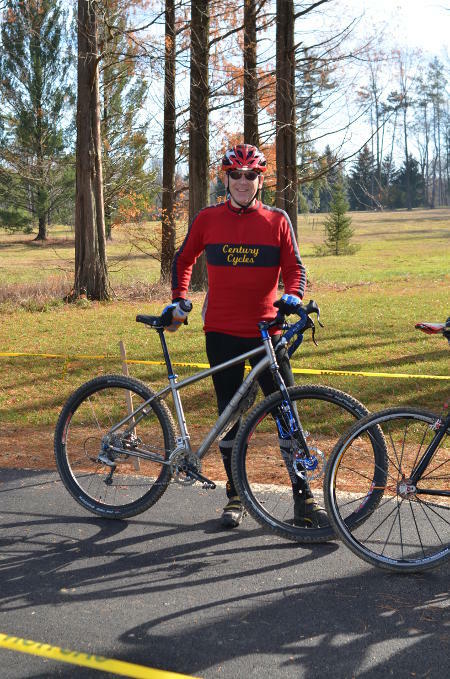 The next (and final) race of the Northeast Ohio Cyclocross Series is this Sunday, December 9 in Broadview Heights. 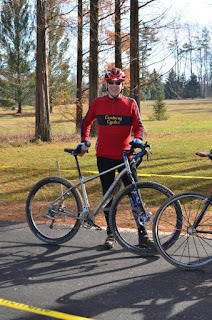 Thanks to my friend Dave for the event photos and the post-race beers! 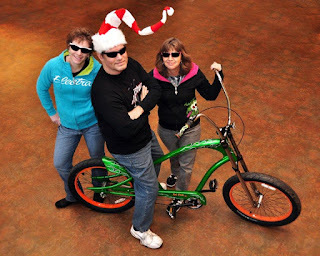 Cathy, Bob, and Lynne from Century Cycles - Medina show off the stylish new Electra hoodies -- AND a good reason for Santa to consider adding a way-cool Electra Rat Fink cruiser to his own personal wish list! 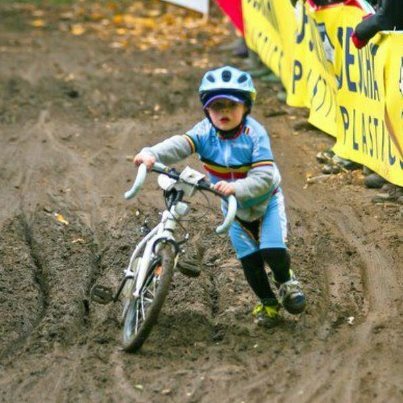 Twenty-one people liked this photo of a little cyclocrosser, which proves you're never too young (or too old?) to try the sport. Take a kid bicycling, won't you? 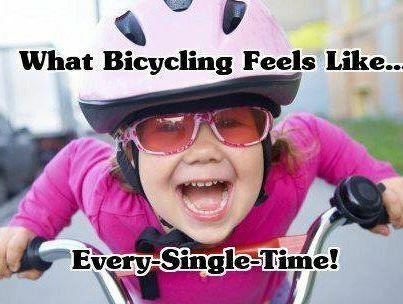 It's fun for you and them, it burns off all that crazy-energy they have, it's the best way to grow adult bicyclists, and it will probably make the world a much better, kinder place. Then take a picture and send it us -- we obviously are suckers for cool pics of cute kids on bikes.